Compared to other cells of the body the erythrocyte, consistent with its simple functional requirements, has a simple structure. The erythrocyte delivers oxygen to tissue and aids in carriage of carbon dioxide back to the lungs. Oxygen is carried by haemoglobin. Haemoglobin is a very reactive molecule. Extracellular haemoglobin is toxic because of it’s ability to scavenge nitric oxide and cause oxidative injury to the vessels and kidney (Cold Spring Harb Perspect Med 2013 Jun; 3(6): a013433). The erythrocyte is a packet of concentrate haemoglobin solution enclosed by a membrane. It has no organelles. All the biochemical pathways are geared to maintain iron in a ferrous state and prevent oxidative damage. Oxygen delivery involves protecting tissue from the toxicity of haemoglobin and delivering oxygen to the narrowest parts of circulation. The erythrocyte membrane participates in both the functions. The former is achieved by a selective permeability. The erythrocyte membrane reduces the NO scavenging 1000 fold (J Biol Chem 2005 Nov 25;280(47):39024-32 ) and protects tissue from oxidative injury. The latter is achieved by extreme deformability the erythrocyte membrane provides. The erythrocyte has a cell with a diameter of 7-8µm. It needs to squeeze past capillaries (3µm) and sinusoids (1-2µm). Extreme deformability of erythrocytes allows a smooth passage through the narrowest parts of the circulation. A sphere is has the smallest surface area for a given volume and as a result the least deformability. Erythrocyte has a biconcave shape that gives it more membrane for volume and allow extreme deformability. Membrane dysfunction result in erythrocyte change in shape and deformability. Such cells are not able to pass thought splenic sinusoids and are haemolysed. The haemolysis is usually extravascular. Extravascular haemolysis has few clinical consequences other than those related to increased bilirubin production. Membrane damage due to physical, chemical and immune mediated injury results in intravascular haemolysis that has a potential to cause serious injury. The red cell membrane consists of a lipid bilayer, traversed by proteins and anchored to a cytoskeletal scaffolding made of spectrin. The cytoskeleton provides the extreme deformability and the lipid layer provides the selective permeability. Erythrocyte membrane defects may be due to defects in the lipid bilayer, defect in the cytoskeleton or defects in the attachments of the lipid bilayer to the cytoskeleton. Defects in cytoskeletal and anchoring proteins are inherited (see table below) and those in the lipid layer are usually acquired. The figure below is a schematic relationship between erythrocyte membrane proteins and lipid membrane bilayer. The main component of cytoskeleton is spectrin. Spectrin is a tetrameter made of two α- and two β- subunits. 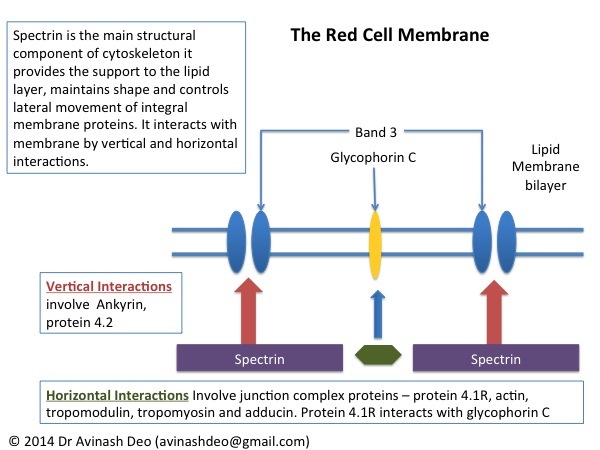 Spectrin is tethered to the cell membrane by vertical interactions with band 3 proteins via ankyrin and to protein 4.2. Spectrin also has horizontal interactions with protein 4.1, actin, tropomodulin, tropomyosin and adducin. Protein 4.1 interacts with glycophorin C, a trans-membrane protein. Regulating the lateral movement of integral membrane proteins. Spectrin is a tetramer made of two chains α and β. The α and β that wind around each other to form dimers. Two dimers associate head to head to form a tetramer. The α-chain is encoded by the gene SPTA1 (OMIM 182860). The β-chain is encoded by the gene SPTB (OMIM 182870). Defects is either of the spectrin genes cause hereditary spherocytosis but with a different inheritance pattern. The rate of synthesis of the β-spectrin limits the formation of the spectrin tetramer. Spectrin deficiency may occur even with slight impairment of β-spectrin synthesis. This may be seen in a patient who is heterozygous for a β-spectrin defect. Autosomal dominantly inherited hereditary spherocytosis is a consequence of defects in the β-spectrin gene ((type 2 hereditary spherocytosis). Unlike β-spectrin α-spectrin is synthesised in a excess. Both the alleles need to carry mutation for levels to fall to a level that hampers spectrin tetramer assembly. Hereditary spherocytosis (type 3 hereditary spherocytosis) due to α-spectrin is inherited in an autosomal recessive manner. Ankyrins are adaptor proteins.The erythrocyte ankyrin, ankyrin-R is encoded by the gene ANK1 (Entrez 286) located at 8p11.2. Ankyrin binds spectrin to the red cell membrane. Ankyrin deficiency leads to decreased incorporation of spectrin on the membrane despite normal spectrin synthesis. Ankyrin gene mutations lead to autosomal dominant hereditary spherocytosis (type 1 hereditary spherocytosis). Band 3 glycoprotein of the erythrocyte membrane that is coded by the gene is SLC4A at 17q21.31 (Entrez 6521). The membrane domain of band 3 transports anions across the cell membrane. The cytoplasmic domain binds the lipid membrane to spectrin via ankyrin. Mutations in the band 3 glycoprotein result in hereditary spherocytosis (type 4 hereditary spherocytosis), hereditary acanthocytosis, southeast asian ovalocytosis and hereditary stomatocytosis. Protein 4.1 stabilized the spectrin-actin interactions. It is encoded by the EPB41 gene at 1p35.3 (Entrez 2035). Deficiency causes hereditary elliptocytosis. Disruption in the cytoskeleton is the basis of in a viariey erythrocyte disorders charecterzid by alterations in erythrcoyte shape (see tabel and figure above). Disruption in vertical interactions results in instability of lipid layer resulting in loss of lipid layer and spherocytosis. Disruptions in horizontal interactions results in hereditary elliptocytosis. Changes in the lipid layes also results in changes in erythrocyte shape. Unlike disorders ofthe cytskeleton, most of these disorders are accquired. Target Cells: Traget cells or codocytes are cells that have an appearance of a shooting target with a central bulls eye. Reletive increase in the membrane lipids results in the formation of target cells. This is seen in severe microcytis anaemias like severe iron deficiency, thalassaemia, haemoglobin C disease and haemoglobin E disease where the intracellular contents decrease. It may aslo bee seen in obstructive liver disease where the lipid and cholesterol content of the membrena increase. Stomatocytes: Stomatocytes are erythrocytes with a central elongated mouth-like area of pallor. Expansion of the inner layer results in stomatocytosis. This may be seen in alcoholism and with the use of vinca alkaloids. Echinocytes Ecchinocytes are cells that are no longer disc shaped and are covered by 10-30 short projections. The change is because of expansion of outer lipid layer. Ecchinocytes are seen in uraemia, pyruvate kinase deficiency or may be a fixing/staining artefact. Acanthocytes: Acanthocytes are cells with a few spiny projections on the surface (from acanthus, The Greek word for thorn). The result from accumulation of cholesterol (liver disease) or sphingomyelin (abetalipoproteinaemia) in the outer lipid layer results in acanthocytosis.